Pulmonaria – Dig Delve – An online magazine about gardens, landscape, growing & making. It took us the best part of a month to strip last year’s skeletons from the garden and to ready the planting for spring. It was good to take the time to acclimatise the eye and to look with care at what had been happening over the past year at ground level. Monkishly bald centres in a couple of the cirsium revealed that they need splitting to retain their vigour. Now that they have shown themselves again after winter dormancy, the advance of the Eurybia x herveyii will either need to be kerbed or, if I am brave enough, allowed to mingle and test both the tolerance of their neighbours and my courage to let the garden evolve as it wants to. The feeling of openness is a shock at first, when all you have to counterpoint it is the flush of mid-February snowdrops, but by March I am happy to have the clean start. That said, I am keen to fill the gaps and for the ground to already be offering interest. Textures of evergreen epimedium and melica that have been happy in the shadows and the interest of new signs of life. Molly-the-witch and other early peonies, almost as good in the push of new shoots as they are in flower. The shine and lustre of Ranunculus ficaria ‘Brazen Hussy’. These early-to-rise participants are key. Not only do they engage you, like a flare that catches the attention, but they are invaluable for the early bees too, which on the still days are already working the catkins on the willows in February. 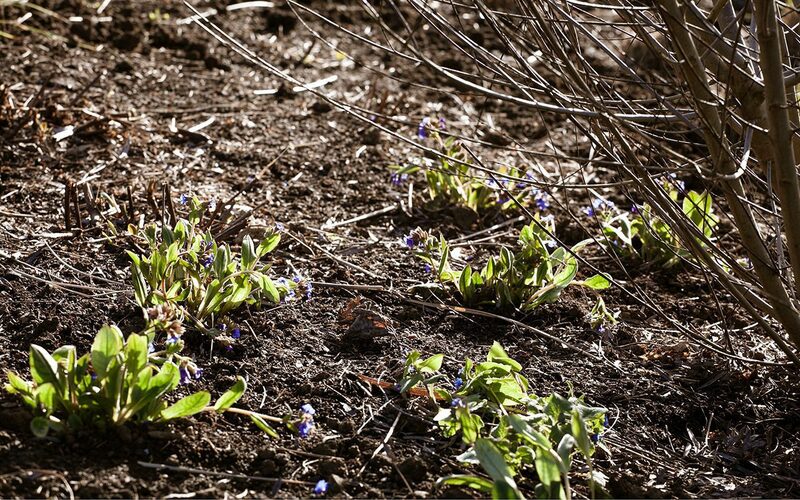 This is the second spring in the new planting and already I can see that I am wanting more lungwort. Pulmonaria rubra, one of the easiest and a present from a neighbour who isn’t a gardener but can rely upon it for needing little attention, was planted deliberately close to the verandah of the studio. This faces the morning sun and I leave the doors open as soon as there is a day warm enough to work at my desk with a connection to the outside. The sound of the first bumble bees working February flower is amplified in the trumpet-shaped blooms in an orchestra of activity that reminds me that I have a responsibility for the garden to offer as much early forage as possible. 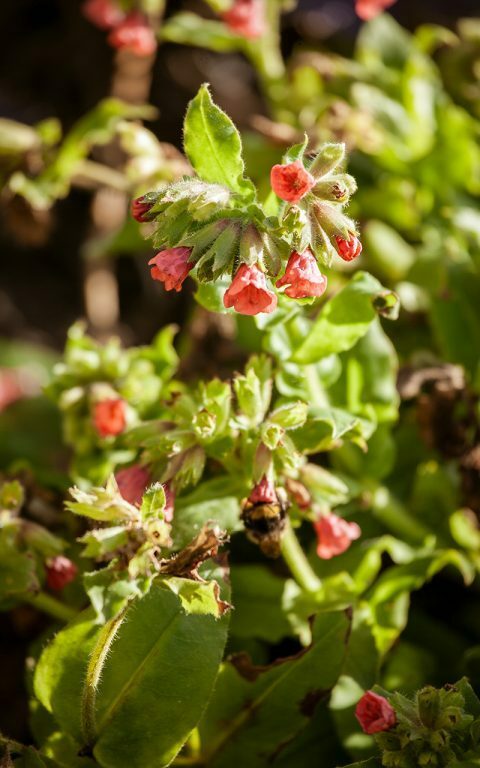 Pulmonaria rubra is a modest plant, with plain apple green foliage and soft coral red flowers that fade pleasantly, like well-washed fabric, as they age. With me it is up and in flower in December and completely evergreen and so reliably weed suppressing. 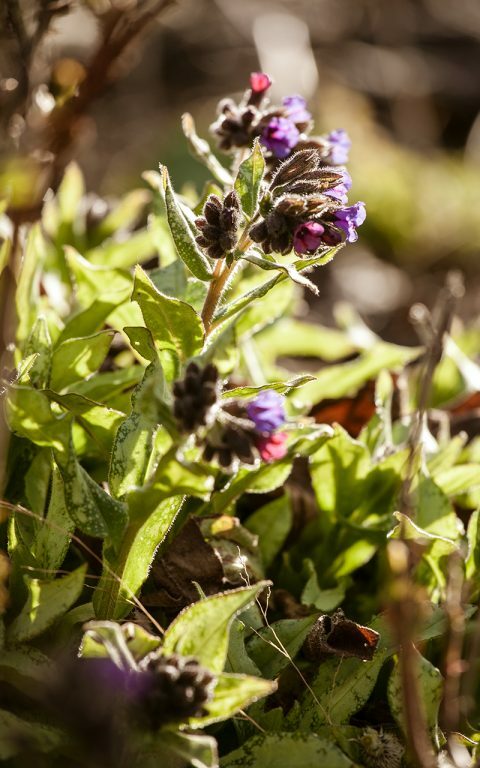 Where most pulmonarias by nature are edge of woodland or damp pasture plants, on our heavy ground this is an easy lungwort and quite happy here out in the open. Retentive soil or a cool position is their favoured habitat and one that makes them very useful amongst summer plants that rise above or overshadow them later in the year. At the Beth Chatto Symposium last August, I was interested to hear how committed Cassian Schmidt was to using early ground covering plants at Hermannshof to protect the soil and suppress weeds early in the season, as well as providing early flower interest. He had introduced a layer of Primula vulgaris and early bulbs so that the ground was always covered and occupied between later-appearing perennials. As time goes on I will introduce more bulbs, but the likes of the lungworts, alongside violets and primulas, will be ideal in helping to provide this layer with the aim to combine plants that are happy in each other’s company, not fighting or competing, much as they would do naturally on the forest floor. 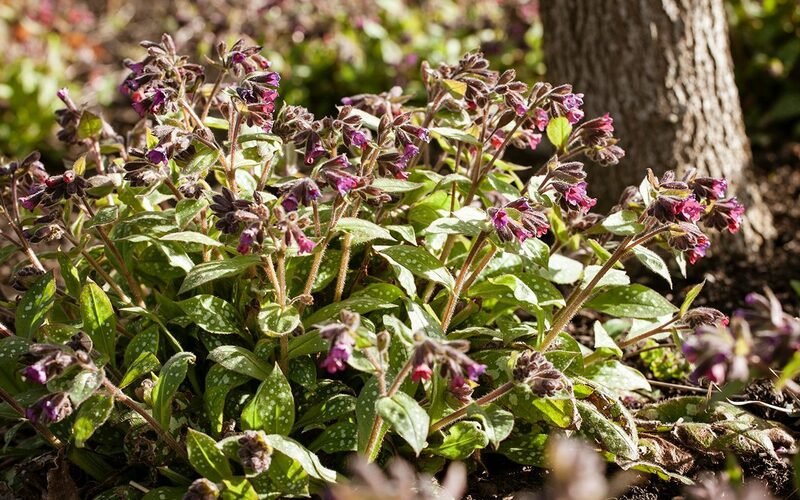 Where the shrubby Salix gracilistyla blur the garden’s boundary with the field, I have been busily planting Pulmonaria ‘Blue Ensign’. This time last year we painstakingly removed the Galium odoratum that in just a season had run riot there on our hearty ground, threatening to engulf every perennial in its path. We threw the mats of bedstraw down under the crack willow on the ditch, where it has now found its place and is behaving much better with other native plants that are up for the competition. I left the area fallow during the summer to ensure I hadn’t missed a bedstraw tendril but, as autumn opened up the area again, I have replaced it with Pulmonaria ‘Blue Ensign’. 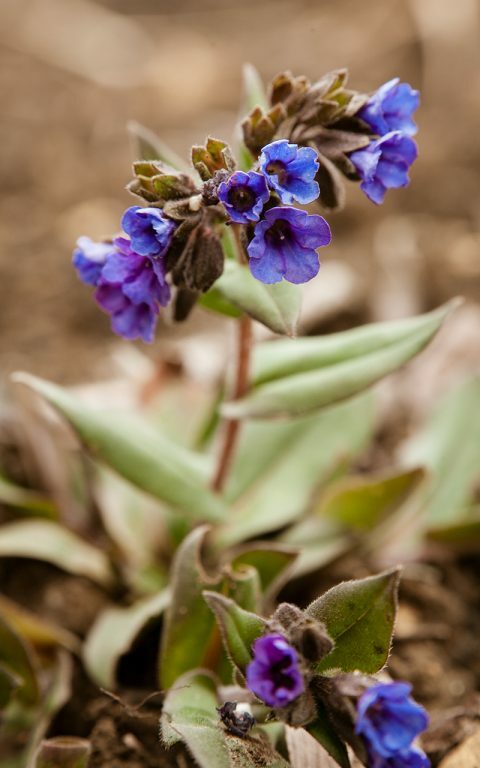 This highly floriferous lungwort has an electric, gentian-blue flower, that first appears in February and continues to build in volume through March into early April. It also has a simple green leaf, coppery at first, smaller and fleshier than P. rubra. The plants are clump-forming and will survive for many years without splitting. New plants are put in at around a foot spacing and I expect them to touch and do their job of protecting the soil by autumn. Though I initially introduced the lungworts here at Hillside with two that have plain, green foliage, a more typical characteristic is the mottled leaf which appears in some as a dappling of light-reflecting pearly spots, in others a more dramatic complete silvering. The Latin name is derived from pulmo, meaning lung, as the spotted leaf was thought to resemble an ulcerated lung and in early apothecary gardens it was used as a treatment accordingly. Silver plants are usually adapted to refract light in bright sunny conditions, but the silver-leaved pulmonarias are a welcome element to brighten the shadowy places. The Pulmonaria officinalis selections and hybrids typically have the dappled leaf and offer a wide choice of colours ranging from white to pale blue to cobalt with ‘Sissinghurst White’, ‘Cotton Cool’ and ‘Highdown’ among commonly available varieties. Lungworts are promiscuous so you will soon find seedlings that show variation if you are growing several together, but it is worth seeking out the ones that fit the way you want a planting to feel. Pulmonaria saccharata is the most dramatic of the group, with forms showing much variability, but the silvered and spotted foliage is characteristic. I grew the straight species when I was a boy, having seen them used at Chelsea by Beth Chatto. They thrived in a cool position on our thin, acidic sand and proved their worth in illuminating a garden that needed sparkle once the trees provided shade. Pulmonaria saccharata ‘Leopard’ (main image) is one of my all-time favourites. Again, early to start in February with flowers that age from soft brick red to dusky old rose. There is a lightness in the variation. ‘Leopard’ is a robust plant, easily reaching a foot and a half across and, as the flowers pass as spring gives way to summer, the heavily spotted foliage expands to become the focal point. I first grew it under leafy Tetrapanax papyrifer ‘Rex’ in our Peckham garden and found it prone to mildew in dry summers there, but moisture or a good mulch at the root will diminish this likelihood. Here on our hillside it is pooled under the mulberry where, as the heavy shade gathers, it keeps the darkness interesting. I hope that the erythronium that I’ve laced amongst it will favour me and not find our open hillside intimidating, and that the lungworts will help keep the microclimate more stable for them. 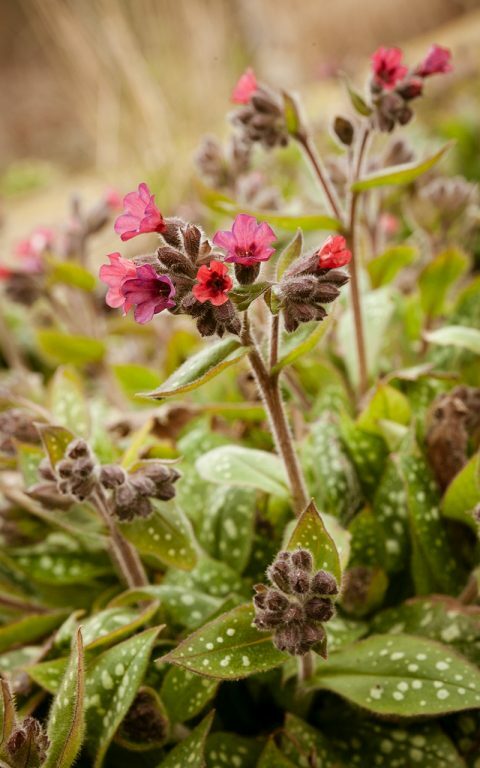 I’m using the silvered varieties carefully here for fear that their eye-catching foliage might prove too ornamental for the feel of the planting, but as a glint of light Pulmonaria ‘Diana Clare’ – which must have some saccharata in her blood – is a treasure as a complement to darker foliage. The flowers are dark plum taking on a violet cast as they age and are tightly clustered as the plant awakens from dormancy. I have them amongst Eurybia divaricata, which overshadows them later in the autumn, but provides a nice scale change. The lungwort with a simple elongated silver-green leaf, the aster fine, lacy and bottle green, ensuring that one end of the season works very nicely with the other so that the garden goes not in fits and starts, but flows between seasons.